Dien Hoa village, in a central province of Vietnam, has become famous for growing bonsai apricot trees. Before the Lunar New Year many people visit the village to choose an apricot tree to decorate their home during the New Year festival, known as ‘Tet’. A 10 year old bonsai can cost thousands of dollars and older specimens more. By selling an old apricot tree, enough money can be raised to build a house. The flourishing trade has brought local villagers a more prosperous life. How beautiful and how interesting that a tree can lead to a better life. Thank you for sharing. The lady I work with in Vietnam is a very keen gardener and font of knowledge about Vietnamese plants and traditions, so we had a great time (and probably bored my colleague stiff). 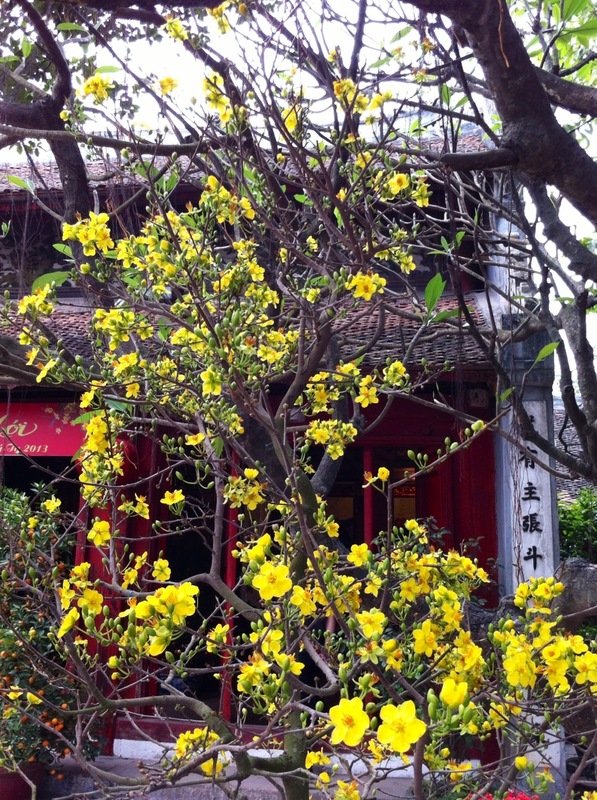 Yellow apricot flower is the symbol of Tet in the Sounth of Vietnam. Without it, people will not have the real feeling of Luna New Year. Well, this is what I thought, but they are 100% genuine and very auspicious in Vietnam. I can’t find a Latin name, but my friend Hang tells me the fruits are dominated by the central stone so not great for eating. There are varieties with bigger, double blossoms which are even more precious and look a bit like Kerria.